Brewpubs in the US are quite common now, but were virtually unknown back in the early 80’s when Bridgeport Brewery converted an old cordage factory into a brewery and began crafting beer from locally grown Willamette Valley ingredients. Portland, Oregon is home to the craft beer craze with Bridgeport being one of the first of the country’s microbreweries. Some called it a crazy idea not only for the basic concept but for embracing a belief that the beer must embody a sense of place. Bridgeport set out to “make a beer as unique as the city that drinks it”. Portlanders loved it. 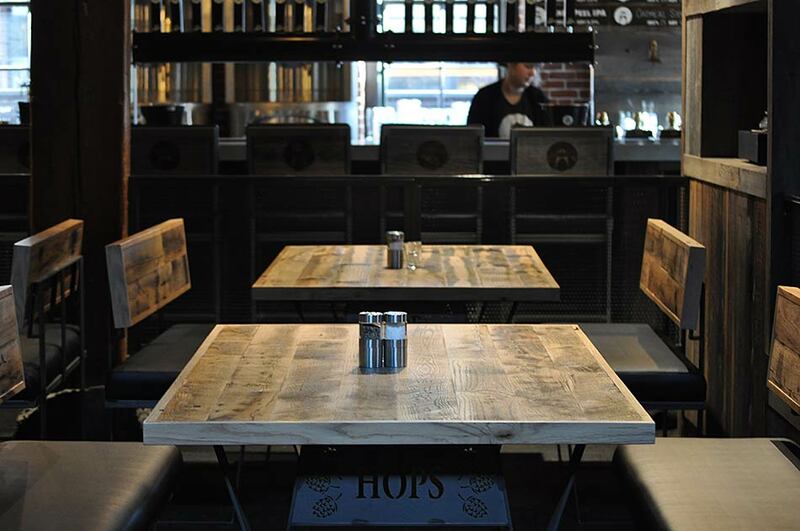 When in town, stop by to enjoy the beer and the well-designed interior. Jim Moore of Moore Architecture + Design wanted to showcase “Oregon’s original craft brewery” and their spirit when giving the brewery a new look. They did by so choosing authentic, natural materials to establish just the right vibe. You’ll find reclaimed oak tables fabricated so the character is maintained. The reclaimed oak surface was skip planed to let the beauty of the oak shine through while keeping some of the naturally weathered patina making for tables with a good balance of rustic. Lost Coast Weathered redwood paneling partners nicely with the distressed look of the tables and the original red brick factory walls. There are now over 90 breweries in the Portland Metro area but a must-see (and taste) is an original like Bridgeport Brewery which helped kick-start the craft beer craze.